Memo to Agong-PETITION TO SET UP A ROYAL COMMISSION WITH VIEW TO MAKE RECOMMENDATIONS TO DISMANTLE AND END ALL MALAYSIA’S INSTITUTIONALISED RACIST POLICIES. RE: PETITION TO HIS HIGHNESS THE MALAYSIAN KING IN CONJUNCTION WITH INTERNATIONAL DAY FOR THE ELIMINATION OF RACIAL DISCRIMINATION. We write in reference to the highest law on our land, the Malaysian Federal Constitution that declares all those born in Malaysia as Malaysian nationals and that which guarantees and confers important fundamental human rights upon all Malaysian citizens. It is upon those bases that we request your Highness’ indulgence on the following issues. Your Highness, we respectfully bring to your attention that our own Malaysian Constitution at Article 8(1) reiterates the first Article of the Universal Declaration of Human Rights, that: “All human beings are born free and equal in dignity and rights”. However, following our country’s independence, the prerogative role of the Agong to determine the extent of the quotas for the Malays and natives of Sabah and Sarawak has been usurped by UMNO and the results have transgressed all norms of human rights and universal human rights standards. Sadly, we witness on a daily basis the inequality and lack of freedom, which non-Malay/Muslim Malaysian nationals are expected to endure. We have seen the human destruction and sufferings those inequalities have upon ordinary innocent people. We have been forced to adopt a stance not appreciated by many in the government but having been denied of our right to function as an integral part of society we have had to pursue such an endeavor. We seek to address the resultant gross infringements of the constitutional rights of the marginalized Indians who continue to remain vulnerable in spite of 54 years of opportunity for the UMNO led government to have instituted socio-economic development policies for the marginalized Indians. UMNO chose not to include the Indian marginalized into their development policies because of the overall racial slant of their policies . We all constitute one human family unit. Instead of allowing diversity of race and culture to develop as strength of our unique nation, we have been severely bound up and held back by this race-based mentality imposed by UMNO’s narrow policies. It is our opinion that now is the opportunity to refocus our understanding and bring true equality and freedom into our policies that focus on human values rather than race or ethnicity and to expand our vision to see diversity as strength. We therefore humbly urge Your Highness, as the Constitutional Monarch of Malaysia to bring an end to the deeply dividing, entrenched and institutionalized racist policies promoted by the 54-year rule of UMNO government. We would further urge Your Highness that, now, is the time to show your Highness’ compassion for your people and to take real steps to eradicate racism, as well as all types of intolerance, which regrettably has accelerated at an alarming rate in Malaysia through institutionalized racism. The minority communities who feel perpetually wounded, neglected and denied of their right to live in a free and equal society suffer solely due to UMNO party’s institutionalized racial policies. Hindraf appeal for bail for 53 Hindraf activist prosecuted : RM 24,600 collect as at 21/3/2011. Latest RM 100.00 today by Mr. Sugu of Ampang “ Thanks for everything u had done and still doing for us… U r really great Hero. May God always bless u and ur family." To date RM 111,000 bail has been imposed on 53 Hindraf Makkal Sakthi supporters at the Kuala Lumpur, Selayang, Ipoh and Seremban magistrates court todate (14/3/11), and we have received RM 18,870 in contributions from the grateful concerned public. We need to cover the expected shortfall of approximately RM 200,000! Trustees: Certified Public Accountants, Chartered Accountants. We, FRIENDS OF HUMAN RIGHTS DEFENDERS, are appalled by this act of targeting key leaders and their well wishers in the hope that this democratic movement could be clamped forever. We feel sorry for those persons who were detained and some who suffered injuries. We also understand this is an act to prevent Hindraf/HRP leaders from contesting in the next elections, in the vain hope that should they contest the charge will be activated a la Tian Chua and force a by-election. A group of friends and well wishers have stepped forward as Friends of Human Rights Defenders, to raise funds and post bail and related expenses for those 100 odd persons who have been prosecuted or expected to be charged. The money collected will be placed in a bank account operated by independent accountants as ‘clients account’ and will be disbursed solely for bail, legal fees and allowances for those prosecuted for those who stand up for human rights. We shall administer these funds in the most professional manner, account for the funds disbursed and make it public by placing the details of collections in the Human Rights party website http://www.hrp-my.org/. We urge all Malaysians, including Chinese and Malays to show their support and contribute as approximately is require for bail, for legal fees and allowances for those prosecuted for standing up. For human rights concerns all, not just the Indians. Fighting for human rights is fighting for all. In first world civil societies, the majority bends backwards to stand up and protect the minorities. That would be the definition of a civil society! Amidst the various unfounded and malicious allegations, HINDRAF is publishing its accounts to the public for their scrutiny. Hindraf was formed in December 2005 and it only came to limelight in August 2007 after I had filed a class action against the UK Government on Malaysia’s 50th Anniversary independence celebration on August 30th 2007 in pursuit of the systematic marginalized state of the Malaysian Indians. The accounts prepared by an independent Public Accounting firm regulated in Malaysia for the funds that were collected is attached herewith The full accounts are also available at our website at www.hindraf.org , www.makkal.org , www.humanrightspartymalaysia.com and www.hindraf4you.blogspot.com. b) A further sum of RM110, 000.00 was cash collected through personal donations, which was initially placed in the hands of Paparaidu a/l Veeraman has been placed in interest bearing clients account of Messrs Kumar Hashimah & Co.
c) A sum of RM35,000.00 was banked into my credit card account by ASP Vasanthakumar whilst I was away from the country on 8th December 2007which is now placed in the hands of the accountancy firm. e) A sum of RM 50,000.00 that was collected from members of the public to bail P.Uthayakumar was handed over to Ganapathi Rao a/l Veeraman, one of the ISA detainees who had nominated his brother Paparaidu a/l Veeraman to stand as bailor and deposit the said RM50,000.00 in court under the name of Paparaidu a/l Veeraman. Paparaidu and/or Ganapathi Rao had refused to return to HINDRAF the said bail sum of RM50, 000.00 vide his lawyer’s letter dated 14.12.2009.
f) The total amount collected by Hindraf from the account of Hindraf Enterprise is reflected in our accounts. This is only the sum that we are aware of the portion of the money that came into our possession to our trusted HINDRAF allies by the transfers made by ASP Vasanthakumar. g) The total amount collected for and on behalf of Hindraf by Hindraf Enterprise has to be made public and accounted for by ASP Vasanthakumar. We are only accounting for that portion of the money that came into our possession by the transfers made by ASP Vasanthakumar. h) The funds collected were for the purpose of dealing with the costs of the cases arising from the various arrests of HINDRAF activists. The funds were specifically never collected for the purpose of the civil suit filed in the British Court as some have alleged. In summary therefore, the total amount that we have to account for is RM451,617.51. The expenses we have incurred so far is RM163,278.05. The balance is RM 288,339.46 which includes RM 82,182.28 nationwide fund raising dinners organised in 2008 to collect for Hindraf activities less RM61,090.00 receivables i.e. the sum of 227,249.46 is entrusted with the Public Accountant as of 31st December 2009. I now wish to comment on the collected funds and on the various allegations on the misappropriation of the funds. From the summary of the accounts above, one can see that none of the money received from the public by Hindraf has been used to finance any purpose other than what it had been collected for, least of all my stay here in the UK. These accounts show the lie, mala fide and mischief in their allegations. When ASP Vasanthakumar first came to our attention about 3 months before the ISA detentions on 13th Dec 2007, he claimed he was a Bank Officer. We allowed him to handle all the Hindraf funds. He had sole responsibility for the funds before the detention. He collected the funds into HINDRAF Enterprise, a stationary business he registered in his personal name and made himself a Director. Based on the sums received from ASP Vasantha Kumar and that he was in control of , it creates an irrationality amongst HINDRAF supporters as to why ASP Vasanthakumar would lodge a police report against Uthayakumar on 7th January 2008 ie 3 weeks after his “ISA arrest” claiming that Uthayakumar and his family members had collected large sums of money which may total RM700,000. The same ASP Vasanthakumar and his cohorts have over the last 6 months continuously defamed me although he was responsible for collected funds which he alleges totals up to RM700,000.00 and this sum was further inflated to Millions by Ganapathi Rao. At the material time I was not in the country nor had any access to the alleged funds as the signatory for the HINDRAF ENTERPRISE account is solely within the control of ASP Vasantha Kumar. In the first week of January 2008 i.e. 3 weeks after the arrest of the Hindraf lawyers, I had issued media statements urging the public not to donate any money to any middlemen and to channel the funds directly to the affected families and my statements were carried by all the major mainstream Tamil papers and Malaysiakini. It was also posted in the official blog of Hindraf and many other independent Blogs. As such, it defies logic and rationality as to why I am now subjected to continuous serious allegations of funds collection and misappropriation other than to seed unwarranted suspicion and doubts by ASP Vasantha Kumar as part of the government’s “operasi padam HINDRAF” conducted by the Police Special branch to permanently erase Hindraf and its struggle from the minds of the people and to cause confusion and mistrust. HINDRAF is a movement of conscience and humanity to uplift the systematically marginalized Malaysian community in Malaysia. It only seeks to show up the truth and the reality that is faced by the deprived lot daily. It is unfortunate that certain DAP leaders have fallen prey to the Special Branch ploy and had repeated the malicious allegations in their pursuit to defend their own political agenda based on hearsay and for their political benefits as opposed to the voice and need of the marginalized community. HINDRAF’s enemy is the oppressive system led by UMNO. UMNO for its part seeks to permanently erase HINDRAF from the annals of Malaysia, using these and various other treacherous tactics. No matter how hard they try, we will try harder. Truth and justice is on our side. We are well equipped morally for this struggle. Hindraf well-wishers must be prepared for the truth as the truth always prevails as we continue to be defiant for a humane and moral cause. The racist tenor of a novel, to be included in school curriculum, rankles ethnic Indians, but the government thwarts a protest. Najib Tun Razak, Malaysia’s Prime Minister. THE detention of more than 100 human rights activists in Kuala Lumpur on February 27 may not have caught much international attention amid the political ferment across the Arab world. However, the relevant issue at stake in Malaysia is nothing less than a public allegation of “racism” or “racist overtones” against the country’s minorities. Significantly, the Malaysian authorities acted with considerable restraint in dealing with the protest planned by the activists, almost all of whom belong to the minority ethnic Indian community. Not only that, even before the protest was nipped in the bud the Malaysian government headed by Prime Minister Najib Tun Razak, who prides himself on his “1Malaysia” policy, announced that it would look into the issues at stake. In particular focus is a controversial novel Interlok, written in Malay, the language of the Muslim-majority Malays in the multiracial South-East Asian country. The education authorities have been trying to introduce Interlok (or “Interlock” in English), in the high school curriculum. Leading the protest against this move is the outlawed Hindu Rights Action Force (HINDRAF), a maverick but educated and proactive group at the forefront of efforts to create a new and modern identity for Malaysian Indians. The protest march planned for February 27 was given advance publicity, with HINDRAF even internationalising the issue to some extent by alerting several worldwide human rights groups. It was to have been led by P. Uthayakumar, pro tem leader of the Human Rights Party Malaysia (HRP), which straddles a grey area of the law by being an organisation that has been neither registered or accredited nor outlawed formally. In any case, in the eyes of HINDRAF, Uthayakumar, as its founder, was the right person to launch the protest. However, Uthayakumar was arrested outside his residence when he was about to proceed to the venue of the protest. Other would-be protesters were also taken into custody at different places across Kuala Lumpur, including the points of entry into the city from elsewhere in Malaysia. As a result, the protest march did not take place, but there was no outbreak of violence. The Malaysian authorities treated the protest call as an “illegal” act ab initio because the police had rejected a relevant application on the grounds of avoiding interracial tensions. HINDRAF’s counterpoint, though, was that Malaysia’s federal Constitution guaranteed the freedom of assembly and expression of peaceful protest. After the arrests, even as HINDRAF tried to keep the issue in focus, the Malaysian authorities thanked non-governmental organisations of ethnic Indian origin for prevailing upon the minority community to avoid street demonstrations. The NGOs were also credited with counselling ethnic Indians to get the primary issue addressed through democratic dialogue with the relevant authorities. As such a largely unnoticed battle for the moral high ground was on between the Malaysian authorities and HINDRAF, some of the latter’s activists began a vigil outside a police station in Kuala Lumpur where Uthayakumar was believed to have been detained. On the whole, the situation remained firmly under the authorities’ control, and the detained HINDRAF activists, including Uthayakumar, were set free, some of them on bail. However, HINDRAF maintained that the supporters who kept vigil were detained in a fresh action late on the night of February 27. Surely, these events bore none of the hallmarks of the latest political maelstrom in West Asia. However, familiar norms such as “people’s voice” and “political change”, or some variants of these principles, are acquiring new meanings or interpretations in several countries outside the Arab world. The political ferment in the Arab countries may have either inspired or simply provided, as in the case of Malaysia, a topical context for such a new awareness in these countries. But the issues at stake in Malaysia are obviously far different from those in West Asia or in China, where the authorities, coincidentally, went on a security alert in Beijing and Shanghai on February 27 following some mysterious Internet calls for “protest”. Malaysia, which is marginally coming into focus in this new-wave politics across the world, is already an upscale developing country with a strong track record of overall stability at home and reliability as an international player. The country has at least two very distinctive minorities to cater to – Chinese immigrants and ethnic Indians. Since its independence, Malaysia has functioned under a “social contract” centred on power sharing among some political parties in an invariable ruling coalition called the National Front. Each of its constituent parties traces its roots to and derives its daily sustenance from a distinctive social group – the majority Malay-Muslims or one of the other native communities or the ethnic Chinese or the people of Indian origin. Until the advent of HINDRAF a few years ago, the political space in this minority domain was dominated almost entirely by the long-established Malaysian Indian Congress (MIC). As a key component of successive National Front governments led by the United Malays National Organisation (UMNO) at the federal level, the MIC is still a formidable force despite some latent challenges to its primacy from within the ethnic Indian spectrum. Members of the Hindu Rights Action Force at a rally against racism in Kuala Lumpur on February 27. The ethnic Indian community is often seen as a distinctive group with “external” cultural practices and social mores. However, today’s Malaysian Indians, with no political link whatsoever with India, do not wish to be seen or treated in that fashion or in that fashion alone. They do not wish to be regarded as merely the descendants of Indians who were brought from southern India by the British to work on plantations. This aspect of the Malaysian Indian identity, variously seen by the “new leaders” of the community itself and by some sections of the wider society in Malaysia, is at the heart of the latest unease, if not also large-scale unrest, among ethnic Indians there. Closely linked to HINDRAF, with regard to a number of agendas and activities, is the as-yet-unregistered HRP. HINDRAF is led by Waytha Moorthy, who chose self-imposed exile after playing a leading role in organising, in Kuala Lumpur in November 2007, a much-noticed public protest against the alleged “marginalisation” of Malaysian Indians in national and provincial fields. The Malaysian authorities outlawed HINDRAF after a detailed political analysis of the movement following the November 2007 protest, which captured unusual international attention. The HRP, on the other hand, has “aspirations” of catalysing “political reforms” through an advocacy of human rights for all Malaysians, but more especially for ethnic Indians. 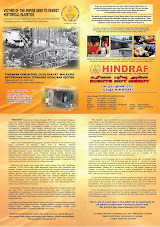 HINDRAF was founded as an NGO to work for ethnic-Indian causes in Malaysia. Uthayakumar, along with other HINDRAF protagonists such as V. Ganapathi Rao (also known as Ganabathi Rau) and M. Manoharan of the Democratic Action Party, was detained under Malaysia’s Internal Security Act in the wake of the November 2007 protest. Over the years, HINDRAF has been widely criticised in Malaysia, including in the ethnic Indian circles such as those of the MIC, for advocating what could easily be dismissed as a sectarian agenda. HINDRAF has not so far evoked the kind of political resonance its leaders have been looking for in India, where the secular credo, in name and deed, often dominates the political landscape. Aware of this, Uthayakumar sought to place HINDRAF on the map of overseas Indians at the recent Pravasi Bharatiya Divas held in New Delhi. Conceding that the words “Hindu” and “Action Force” in HINDRAF’s name might not hold any appeal for the secular conscience of the Indian polity, Waytha Moorthy and others who share his line of thinking argue that exclusivist labels are not at all uncommon in Malaysian politics. Moreover, HINDRAF is aware that New Delhi considers the issues concerning ethnic Indians to be entirely Malaysia’s internal matter. Successive Malaysian Prime Ministers have also maintained this and acknowledged India’s attitude of non-intervention. Within these parameters, Malaysian Indians ought to be, in Waytha Moorthy’s view, concerned about the totality of the “racist” tenor of Interlok. Outlining HINDRAF’s position on this issue, he told Frontline that it would not suffice if some offensive “racist” words were deleted from the novel before its planned introduction as a textbook in schools. In his view, the tenor of the entire novel itself was unacceptable. RIOT POLICE WAIT and watch on the premises of a police station as dozens of ethnic Indians (not seen in the photograph) march to file their complaint against the arrest of HINDRAF activists. While it will be inappropriate to reproduce passages from the novel considered to have “racist” overtones since a review of it is pending, Interlok is said (or alleged) to portray, in some passages, aspects of the lives and experiences of those who spoke Tamil or Telugu or Malayalam in the Malaya heartland during the British colonial era. In part, HINDRAF’s argument is that such passages might produce negative images for the present. There are said to be passages derogatory of the ethnic Chinese, as well. But the Chinese have not made common cause with HINDRAF. Another debatable point is whether HINDRAF should have waited for the government’s review of the novel before planning a protest. Far-fetched though it is, the resonance of the Arab anger in Asia cannot be missed. We have come from different background as our forefathers were all in different industries and work throughout INDIA before we were brought to MALAYA. MY great grandfather was a teacher …he came here as the British ruling India, wanted him to teach ENGLISH and set up a school in Kampar , PERAK. He died while teaching in class. He served for 25 years being a teacher and headmaster before his passing …. My grandfather was also a teacher, he served in teaching in the same school for 10 years before he decided to teach tuition for the poor Indians, Malays, Chinese students at his home just taking about RM20 a month …. He was so dedicated to bring up all races in education … some of his students are retired Judges, retired Ministers and civil servants today. He didn’t even thought to segregate students by their races . That’s how he was a genuine teacher for MALAYA students that moment of time. He never a moment thought that only INDIAN students only .. but being a Teacher ,,,,he embrace all students no matter color of skin, race and religion …. 2. How many Indian educated government officers hold a higher post such as Sec. gen. of a ministry, a University Vice Chancellor ( now we have Datuk Jagesthen) , a enforcement Head ..Such as IGP, JPJ , Hospital Chiefs, … have u heard of such position where an Indian man or woman have taken the lead. Why can’t HINDRAF be registered as a political party as they have submitted their application for registration few years ago …. Why can’t the government just give them the opportunity to be a political party …What are they afraid of ????? EVEN , a group called KITA got registered few months ago …. why not HINDRAF. 6. The other races have government funded and assistance funded for their NGO for single mother’s … DO we have such NGO funded or created for poor Indian single Mother’s …. how do we expect such poor mother’s to raise their kids? Not even ASTRO chief, West Port chief, MIC Indian woman chief have helped to look into this matter . Why is that? ( No offence meant to Tan Sri , just to point out the facts only). We need to seriously look at this and many more problems that our community faces … That’s why we need HINDRAF to be a political party to engage into helping poor Indians. We need a group like HINDRAF, and we need to support it … so that our voices are taken seriously in the parliament. Now let’s go together to the ROS and picket there for HINDRAF endorsement. Without that , yes i agree , we can’t move forward …. so let’s focus this as a more serious agenda then the rest …. as we are looking into election of PRU13 soon. My dear Indian’s, including Indian Muslim …we urge u to stand tall with us united to get what would help the future of our kids . Many Indian Muslim doesn’t feel they are indian … as our Tun too doesn’t admit he is one …. what a sad situation ..But ..when he was admitted to Singapore university ..application was stated and signed he is an Indian Muslim …. well why used Indian first then Muslim by the way ….if Indian Muslim brothers are shy to use it then …sorry for u as u forgot your existence from where have u come from ???? MIC President and mandore deputy minister forced to beg UMNO to withdraw Interlok. 9 Tamil schools to close down. 2,000 Indian families in Taman Kaya, Taiping denied Tamil school.